iPod has come out for more than fifteen years, its fashion appearance and the convenience of carrying music form won the heart of everyone. With the iTunes Store you can load up your iPod with your favorite songs but what about without iTunes? 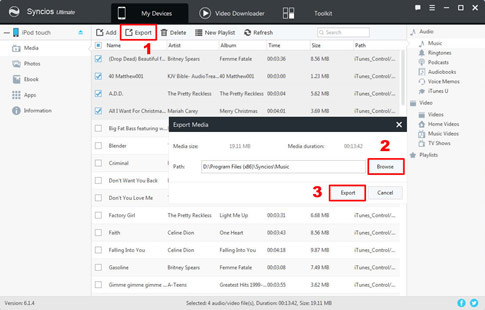 Syncios Manager and Syncios Data Transfer both create a platform to transfer music without iTunes for your iPod. The specific tutorial is under below, let's start to learn these! Tips: iTunes must already be installed on your computer in advanced. 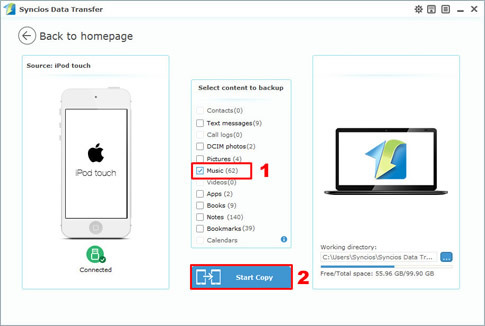 But you do not have to run iTunes during using Syncios Manager and Syncios Data Transfer. Please install Syncios Manager on your computer to prepare for transfering. After installed successfully, connect your iPod to Syncios Manager via USB cable. (Any detection problem, please check our iOS tutorials). Once you connect successful, the basic information of your iPod will shown on the screen. Select 'Media' option first and make sure you've already opened the music mode to see all your music files. Then select the certain song you want to transfer and click 'Export' button on the top of the menu bar. The popup window will shown up, select the saving path you want and click 'Export' to finish transfering. Please install Syncios Data Transfer on your computer to prepare for transfering. After installed successfully, you will see four main function display on the panel. 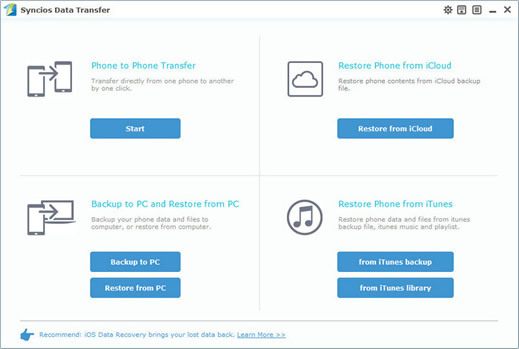 Now select 'Backup to PC' option and connect your iPod, iPod Touch to your computer via USB cable. (Any detection problem, please check our iOS tutorials). Once it connect successful, your iPod will shown on the left side of the primary window. In the middle of the interface, all contents of your iPod are shown on it. Select the 'Music' checkbox and click "Start Copy" button. After a few minutes, all your music files will be copied to your computer.